Faroese (/ˌfɛəroʊˈiːz/; Faroese: føroyskt mál, pronounced [ˈføːɹɪst mɔaːl]) is a North Germanic language spoken as a first language by about 72,000 people, around 49,000 of whom reside on the Faroe Islands and 23,000 in other areas, mainly Denmark. It is one of five languages descended from Old West Norse spoken in the Middle Ages, the others being Norwegian, Icelandic, and the extinct Norn and Greenlandic Norse. Faroese and Icelandic, its closest extant relative, are not mutually intelligible in speech, but the written languages resemble each other quite closely, largely owing to Faroese's etymological orthography. The Sheep letter (Faroese: Seyðabrævið) is the oldest surviving document of the Faroe Islands. Written in 1298 in Old Norse, it contains some words and expressions believed to be especially Faroese. Around 900, the language spoken in the Faroes was Old Norse, which Norse settlers had brought with them during the time of the settlement of Faroe Islands (landnám) that began in 825. However, many of the settlers were not from Scandinavia, but descendants of Norse settlers in the Irish Sea region. In addition, women from Norse Ireland, Orkney, or Shetland often married native Scandinavian men before settling in the Faroe Islands and Iceland. As a result, the Irish language has had some influence on both Faroese and Icelandic. There is some debatable evidence of Irish language place names in the Faroes: for example, the names of Mykines, Stóra Dímun, Lítla Dímun and Argir have been hypothesized to contain Celtic roots. Other examples of early-introduced words of Celtic origin are: blak/blaðak (buttermilk), cf. Middle Irish bláthach; drunnur (tail-piece of an animal), cf. Middle Irish dronn; grúkur (head, headhair), cf. Middle Irish gruaig; lámur (hand, paw), cf. Middle Irish lámh; tarvur (bull), cf. Middle Irish tarbh; and ærgi (pasture in the outfield), cf. Middle Irish áirge. Between the 9th and the 15th centuries, a distinct Faroese language evolved, although it was probably still mutually intelligible with Old West Norse, and remained similar to the Norn language of Orkney and Shetland during Norn's earlier phase. 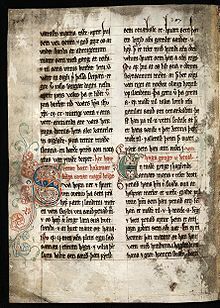 Faroese ceased to be a written language after the union of Norway with Denmark in 1380, with Danish replacing Faroese as the language of administration and education. The islanders continued to use the language in ballads, folktales, and everyday life. This maintained a rich spoken tradition, but for 300 years the language was not used in written form. In 1823 the Danish Bible Society published a diglot of the Gospel of Matthew, with Faroese on the left and Danish on the right. Venceslaus Ulricus Hammershaimb and the Icelandic grammarian and politician Jón Sigurðsson published a written standard for Modern Faroese in 1854, which still exists. They set a standard for the orthography of the language, based on its Old Norse roots and similar to that of Icelandic. The main purpose of this was for the spelling to represent the diverse dialects of Faroese in equal measure. Additionally, it had the advantages of being etymologically clear and keeping the kinship with the Icelandic written language. The actual pronunciation, however, often differs considerably from the written rendering. The letter ð, for example, has no specific phoneme attached to it. Jakob Jakobsen devised a rival system of orthography, based on his wish for a phonetic spelling, but this system was never taken up by the speakers. In 1908 Scripture Gift Mission published the Gospel of John in Faroese. In 1937, Faroese replaced Danish as the official school language, in 1938 as the church language, and in 1948 as the national language by the Home Rule Act of the Faroes. However, Faroese did not become the common language of media and advertising until the 1980s. Today Danish is considered a foreign language, although around 5% of residents on the Faroes learn it as a first language, and it is a required subject for students in third grade and up. The Visit Faroese tourism organisation launched the Faroe Islands Translate online service in 2017, available in English and another 13 languages including Chinese, Russian, Japanese, and Portuguese. A Faroese video database has also been built. Old Faroese (miðaldarføroyskt, ca. mid-14th to mid-16th centuries) is a form of Old Norse spoken in medieval times in the Faroe Islands. The language shares many features with both Old Icelandic and Old Norwegian; Old Norwegian appears closer to Old Faroese, whereas Old Icelandic remained rather archaic compared to other medieval varieties of Old West Norse. The most crucial aspects of the development of Faroese are diphthongisation and palatalisation. There is not enough data available to establish an accurate chronology of Faroese, but a rough one may be developed through comparison to the chronologies of Old Icelandic and Old Norwegian. In the 12th/13th centuries, á and ǫ́ merged as /ɔː/; later on at the beginning of the 14th century, delabialization took place: y, øy, au > /i, ɔi, ɛi/; í and ý merged in addition to i and y, but in the case of í and ý, it appears that labialisation took place instead as is documented by later development to /ʊɪ/. Further, the language underwent a palatalisation of k, g and sk before Old Norse e, i, y, ø, au > /kʲ, ɡʲ, skʲ/ > /cᶜ̧, ɟᶨ, ɕcᶜ̧/ > /tʃʰ, tʃ, ʃ/. Before the palatalisation é and ǽ merged as /ɛː/ and approximately in the same period epenthetic u is inserted into word-final /Cr/ and /CrC/ clusters. The Great Quantity Shift operated in the 15th/16th centuries. In the case of skerping, it took place after delabialization but before loss of post-vocalic ð and g /ɣ/. The shift of hv /hw/ to /kw/, the deletion of /h/ in (remaining) word-initial /h/–sonorant clusters (hr, hl, hn > r, l, n), and the dissolution of þ (þ > t; þ > h in demonstrative pronouns and adverbs) appeared before the end of the 13th century. Another undated change is the merger of ǫ, ø and ǿ into /ø/; pre-nasal ǫ, ǫ́ > o, ó. enk, eng probably became eing, eink in the 14th century; the development of a to /ɛ/ before ng, nk appeared after the palatalisation of k, g, and sk had been completed, such a change is quite a recent development, as well as change Cve > Cvø. Faroese shares with Icelandic and Danish the feature of maintaining a contrast between stops based exclusively on aspiration, not voicing. Geminated stops may be pre-aspirated in intervocalic and word-final position. Intervocalically the aspirated consonants become pre-aspirated unless followed by a closed vowel. In clusters, the preaspiration merges with a preceding nasal or apical approximant, rendering them voiceless. Nasals generally assume the place of articulation and laryngeal settings of following consonants. /ɹ/ becomes retroflex following consonants in consonant clusters, yielding the allophones [ʂ ɭ ʈ ɳ] while /ɹ/ itself becomes [ɻ], example: /rt/ is realized as [ɻ̊ʈ]. Pre-occlusion of original /ll/ to [tl] and /nn/ to [tn]. Pre-aspiration of original voiceless stops [ʰp ʰt ʰk ʰtʃ] after non-high long vowels and diphthongs /ɛaː/ /ɔaː/ /eː/ /oː/ /øː/ or when a voiceless stop is followed by /n, l, r/. All long voiceless stops are pre-aspirated when doubled or in clusters [ʰpː ʰtː ʰkː ʰtʃː]. Faroese grammar is related and very similar to that of modern Icelandic and Old Norse. Faroese is an inflected language with three grammatical genders and four cases: nominative, accusative, dative and genitive. Hvussu eitur tú? Hvað heitir þú? Kva heiter du? Hva heter du? What is your name? Wat is dyn namme? Hvad hedder du? Vad heter du? Wie heißt du? Hoe heet je? Hvussu gongur? Hvernig gengur? Korleis gjeng / går det? Hvordan går det? How is it going? (How goes it?) Hoe giet it? Hvordan går det? Hur går det? Wie geht’s? Hoe gaat het? Hvussu gamal (m) / gomul (f) ert tú? Hversu gamall (m) / gömul (f) ert þú? Kor gamal er du? Hvor gammel er du? How old are you? Hoe âld bisto? Hvor gammel er du? Hur gammal är du? Wie alt bist du? Hoe oud ben je? ^ Hammarström, Harald; Forkel, Robert; Haspelmath, Martin, eds. (2017). "Faroese". Glottolog 3.0. Jena, Germany: Max Planck Institute for the Science of Human History. ^ While the spelling Faeroese is also seen, Faroese is the spelling used in grammars, textbooks, scientific articles and dictionaries between Faroese and English. ^ Barbour, Stephen; Carmichael, Cathie (2000). Language and Nationalism in Europe. OUP Oxford. p. 106. ISBN 978-0-19-158407-7. ^ "History and Diachronic Variations - Medieval sources" (PDF). wanthalf.saga.cz (part of a book). Retrieved 22 October 2015. ^ "The Faroese Language". University of Valencia. Retrieved 2017-08-23. ^ "Faroese language". Encyclopædia Britannica. Retrieved 2017-08-23. ^ "Snar.fo, Jakob Jakobsen (1864-1918)". ^ "Faroe Islands launch live translation service". BBC. 2017-10-06. For a list of words relating to Faroese language, see the Faroese language category of words in Wiktionary, the free dictionary. Wikivoyage has a phrasebook for Faroese. 'Hover & Hear' Faroese pronunciations, and compare with equivalents in English and other Germanic languages. This page was last edited on 3 April 2019, at 09:18 (UTC).